I haven’t been back to Vietnam for a few years now, but I imagine that the latest generation of noodle bars and soup shops that have grown up around Hanoi, and in the trendier sections of Ho Chi Minh City (formerly Saigon), look an awful lot like Ben Lowell and Sara Leveen’s fine little East Village restaurant, Hanoi House. 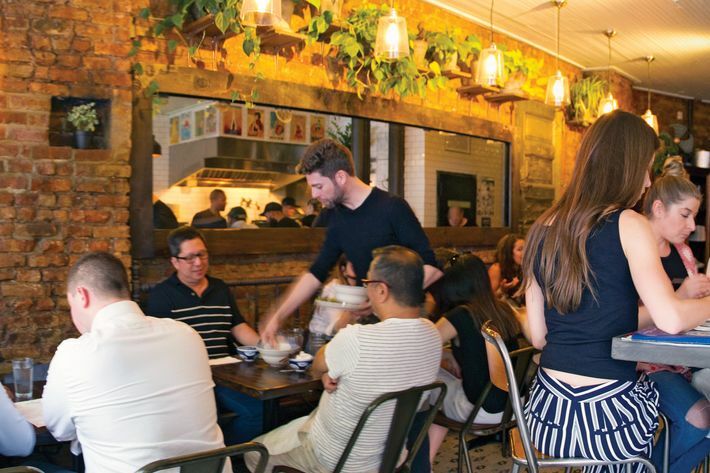 I’m guessing that the dining rooms are small and accessible and fitted, like this one is, with long dining counters where you can sip glasses of frosty dark Laotian lager while enjoying traditional bowls of bun cha and artisanal pho. That there are rows of potted plants set here and there, several of which look like they’ve been borrowed from one of the better courtyard gardens in the neighborhood. That the kitchens are open, the menus small, and the wood-topped tables set with modest but carefully procured blue-and-white bowls, which, like most things in fashionable restaurants around the world these days, are designed to evoke the comforts of home. Neither of the young owners behind Hanoi House is much involved in the buzzing food scene in Vietnam (I’m also guessing), but both are veterans of Stephen Starr’s successful, far-flung hospitality empire (Buddakan, Upland, Le Coucou, etc. ), and they clearly have a feel for the elusive alchemy of comfort, style, and quality that goes into building a popular dining destination in this mysterious, helter-skelter restaurant era. The same goes for their chef, John Nguyen, who briefly worked for the Starr organization and has trained in a variety of upscale restaurants around L.A. and New York. Nguyen is a Vietnamese-American who grew up in Orange County, and like many prominent chefs in the Starr orbit (Justin Smillie at Upland, Daniel Rose at Le Coucou), he’s steeped in the traditions of his chosen cuisine and has a knack for imbuing familiar, homespun recipes with a combination of elegance, integrity, and first-class cooking technique. 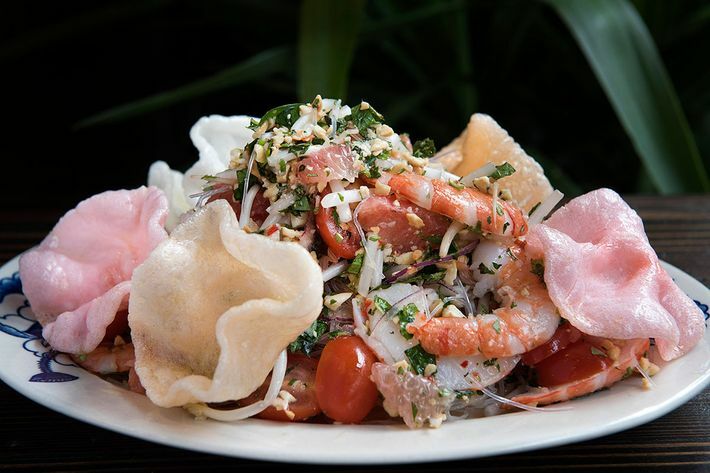 Take that Vietnamese street-food classic, pho, the rich bouillon-and-noodle soup, which, as the loquacious bartenders at this perpetually jammed little establishment will tell you, comes in different regional flavors and styles, much like the great ragùs of Italy. In the north, the broth tends to be meatier and stronger; in the south, it’s sweeter, more subtle, and often served with wedges of lime and other delicate garnishes on the side. Nguyen builds his two-fisted northern version by simmering down a veritable butcher’s bag of ingredients (neck bones, shin bones, oxtail, etc.) for 12 hours. He then layers the broth with spices and aromatics (cinnamon, star anise, cloves, shallots); adds rice noodles, shreds of filet mignon and brisket, and a sprinkling of greenery (cilantro); and gives you the option, for a few extra bucks, of adding oxtail, or a split roasted marrow bone, for an extra umami kick. As connoisseurs of the dish know, a good pho is a meal in itself, but you can complement it here with cooling mounds of glass-noodle-and-grapefruit salad and helpings of tender, almost arrestingly large frogs’ legs, fried to order in a spicy, tempura-style rice batter. The summer rolls at this Vietnamese joint are stuffed with loose slabs of fresh-made pork sausage (nem nuong), and instead of the usual wad of stale vermicelli, little sticks of fried wonton shells are inserted by the kitchen for a pleasingly subversive crunch. The house version of that French-influenced Vietnamese crêpe called bánh xèo is made with a crunchy batter of rice flour and coconut milk, stuffed with a medley of seasonal vegetables (asparagus, mushroom, green-pea purée) and cut in wedges like pizza, and the green-papaya salad is distinguished by the actual greenness of the papaya and a topping of salty, crunchy pig’s ear, which is cut in razor-thin slices, like some sinful form of trencherman’s confetti. 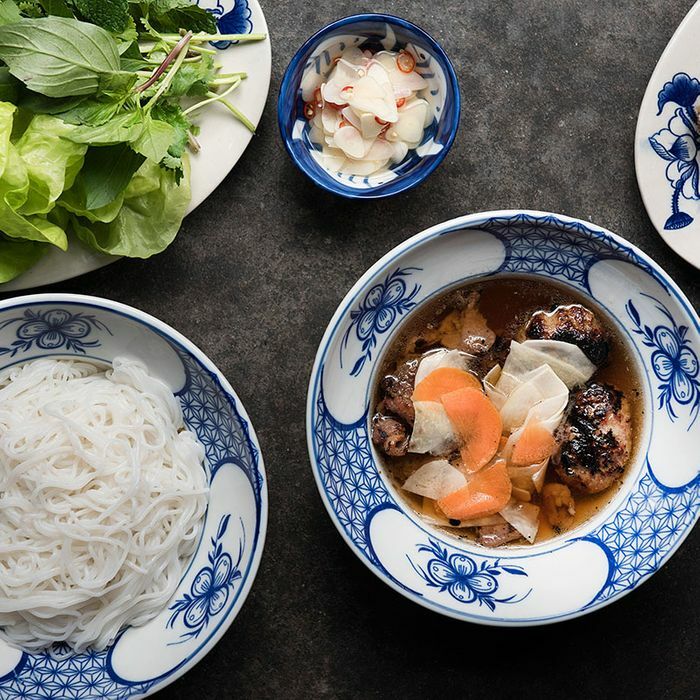 Same-day freshness is one of the hallmarks of Vietnamese cooking, of course, and most of the dishes at Hanoi House come to the table decked with sprigs of mint, tangles of coriander and Thai basil, and great fronds of just-washed lettuce. “This is definitely three-star material, Dad!” cried my discerning daughter Jane as she dug into the sweet-sour restaurant specialty, shaking beef, which is made with chunks of filet mignon, instead of the usual chewy commodity beef, and served with another formidable roasted marrow bone and plenty of greenery. The pork meatballs in that old Bourdain street-food favorite, bun cha, are made with Heritage pork and delicately bound in betel leaves, and the superb, gently honeyed whole fish “ca nuong” is prepared here with roasted trout, instead of the usual Mekong catfish, and hoisted to the table with traditional sauces, one with pineapple and peanuts and another with tamarind. 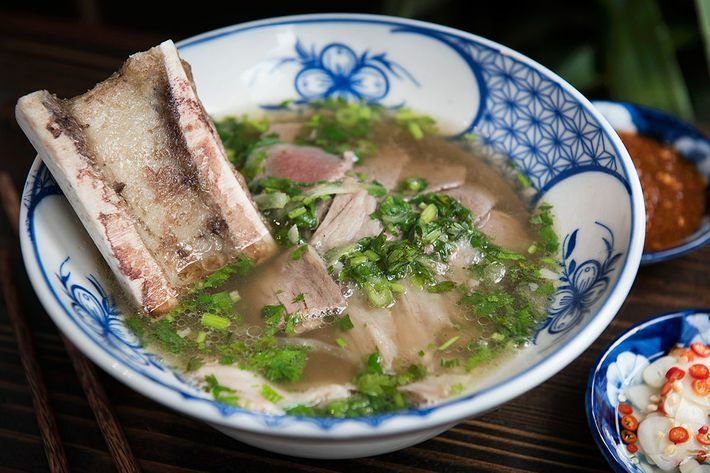 On my visits down to St. Marks Place, there was often a Vietnamese-American family or two mingled among the usual scrum of raucous young gastronauts and pho connoisseurs at Hanoi House, sipping steamy bowls of soup and feeding strings of rice noodles to their kids. 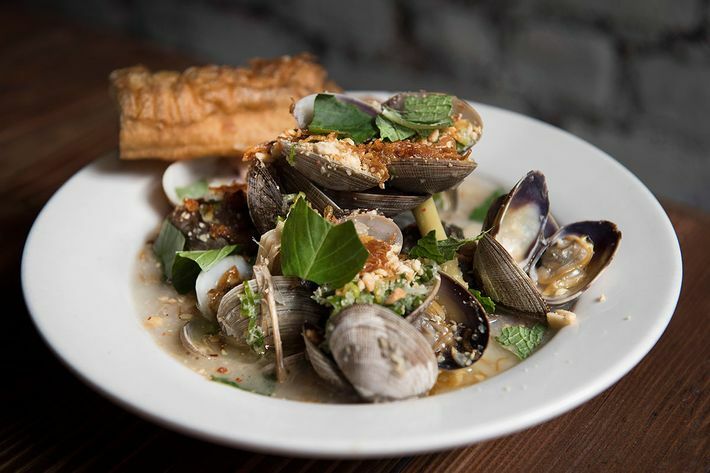 Nguyen & Co. serve up a market-driven special most days, which adds to the sense of homespun creativity in the kitchen, and if the soft-shell-crab bánh mì is available (yes, the aïoli is made with whipped coconut milk), I suggest you order two of them. The same goes for the signature dessert, called chè, which is a kind of frosty sundae made with popular Southeast Asian sweets (jellied pandan, jackfruit, litchi, coconut) all poured with liberal amounts of condensed milk and topped with crushed peanuts. Shaved ice is the usual foundation for this treat, but it’s constructed here with tropical flavors of gelato (black sesame, mango), just the way, I imagine, some of the more inventive dessert bars are doing it along the leafy boulevards of Hanoi. Prices: Appetizers, $8 to $16; entrées, $13 to $28. Ideal Meal: Green-papaya salad, spring-vegetable crêpe and/or spicy frogs’ legs, beef pho and/or bun cha and shaking beef (with crispy spring rolls), chè sundae with black-sesame gelato. Note: This is a no-reservations-for-less-than-six joint, so to beat the crowds, arrive before 6 p.m. This is also the ideal time to sample the chè, since only 18 are served each night. Scratchpad: One star for freshness and the quality of ingredients; one for the gentle, inventive fusing of traditional and modern technique; and another for old-fashioned deliciousness (and because daughters are never, ever, wrong).